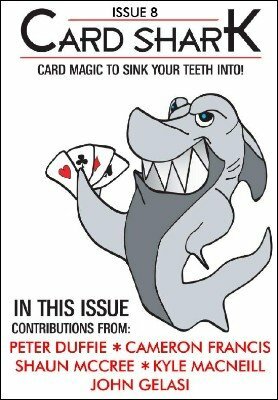 Welcome to Issue 8 of Card Shark , the highly anticipated monthly card magazine that contains awesome tricks from magicians around the world. This issue contains five great tricks, which will feed your card magic needs. Home Spun Psychology by Shaun McCree – An awesome combination of mind reading and magic, ending in a selection magically jumping to your pocket, with no palming. Really direct and completely impromptu. (New). Distinguished by Cameron Francis – A super cool triumph packet routine, with a killer ending that will amaze spectators. From Cameron's great recent Ebook: Let's Get Small! Royal Apex by Peter Duffie – A clever mixture of cutting and Apex Aces gives you a fun, easy and strong effect. From Peter's Ebook Card Tricks for the Fractured Mind . H2Oh No! by John Gelasi – A very cool version of Oil and Water with a surprise ending. Succinct but strong, this is a great little routine. (New). Jubilee Surprise by Kyle MacNeill – A mixture of the Spelling, Whisperers and Transposition plots create a neat routine with any deck of cards. (New). Review Section #1 – We review The Nine of Diamonds (book).